Have you ever needed to print a document or anything while away from your office or out on the road? I have, and on multiple occasions so in this post I wanted to share a simple solution. Just in case you ever find yourself in this same situation or scenario, here’s what you can do. The advice, the tools, and the setup to do the following is all free. 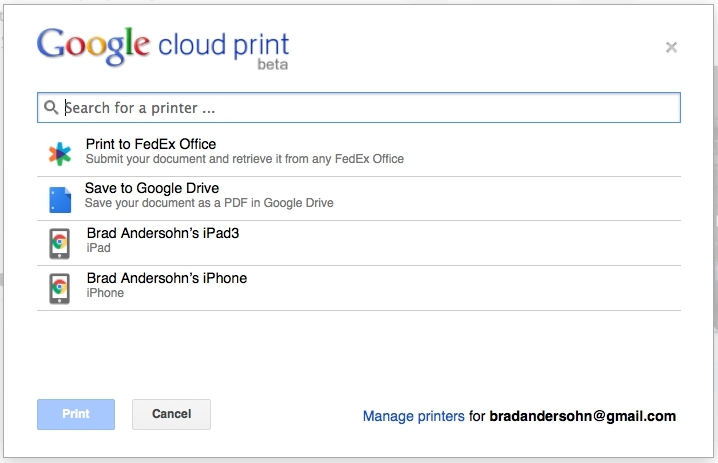 Google Cloud Print is a really cool technology that connects you and your printers to the web. Using Google’s Cloud Print, you can make all your home and office printers available to anyone you choose right from the applications you use every day. This technology works on your PC, MAC, phone, tablet, or any other web-connected device you want to print from. I was in the field traveling and speaking at a real estate event, but needed to print a rental application for a potential tenant. Google Cloud print allowed me to print from a remote location, email a colleague for pick up, and had the document delivered within the hour. Cloud ready printers include: HP, Epson, Kodak and FedEx. There is no doubt that you will eventually run into a situation or circumstance where this tool and feature will save the day for you and your clients, make you the hero, and save you a ton of undue and unnecessary stress. You know what I’m talking about Right? DISCLAIMER: You cannot and will not be able to add paper or new ink cartridges to your printer remotely using Google Cloud printing. But don’t don’t be shocked if Google announces and launches that upgrade in their next round and series of cool tools and services. This video will explain in more detail and give you some other examples of uses. can u pls explain the logic or algorithm that r used in google cloud……any one specific algorithm on hw the print is carried out…..